It's nothing but nets, soft sand and infinite blue horizons in Muskegon, Michigan. You won’t find seersucker-clad couples on tandem Schwinns or a Back to the Future–like clock tower in the town square of Muskegon—the industrial town is far from quaint. But if you’re intrigued by a patch of the Lake Michigan shoreline that’s earned national recognition for its cleanliness, crave miles of trails for hiking and biking, or happen to be a World War II history buff, then it’s well worth a weekend visit. Ask the friendly locals what draws visitors and you’ll hear about the beach. Just three miles from downtown, the 27.5-acre Pere Marquette Park (Beach Street and Lakeshore Drive, 800-250-9283) on Lake Michigan’s shore features two-and-a-half miles of sugar-sand beaches—it’s one of only three nationally certified “clean beaches” on the Great Lakes (which means city officials pledge to control litter, maintain water quality and practice sustainable coastal management and habitat conservation). Beachside parking is usually a breeze in the free lot south of Beach Street and Indiana Avenue, or take a trolley from downtown ($1.25, visit matsbus.com for schedule). Once on the sand, you’re set for hours—restrooms, playgrounds and food are all nearby. Grab a sub sandwich and ice cream from the snack shop or knock back a beer on the deck at Captain Jack’s Bar & Grill (1601 Beach St, 231-755-1555). Tranquility is the vibe here-—there are no watercrafts for rent (which means no noisy engines). Think barefoot strolls along an unspoiled coastline, where the only sights are the bungalows along Muskegon’s Lakeshore Drive, grass-covered sand dunes and a lake view so infinite you’ll think you’re at the ocean. Even the squeamish will be persuaded to swim: The water is clear enough to see your feet, and the lake bottom has smooth, muck-free sand. Some locals will tell you there’s nothing to do downtown, but that’s starting to change thanks to increasing tourism and proud residents opening new businesses. One charming new arrival is Clay Avenue Cellars (611 Clay Ave, 231-722-3108). Housed in a 1920s gas station, this winery produces more than a dozen varieties of fruit wines, ranging from raspberry to cherry. If your tasting renders you a bit tipsy, combat your buzz with a creamy delft blue or zingy horseradish cheddar from The Cheese Lady (808 Terrace Street, 231-728-3000) down the street. Until the regenerating downtown spawns similar gems, history often guides visitors’ agendas. Tours are available of the exquisitely restored Hackley and Hume houses (6th St and Webster Ave, 231-722-7578), side-by-side Queen Anne–style mansions completed in 1889 for lumber baron Charles H. Hackley and his partner, Thomas Hume. World War II buffs will find three impressive vessels to tour. 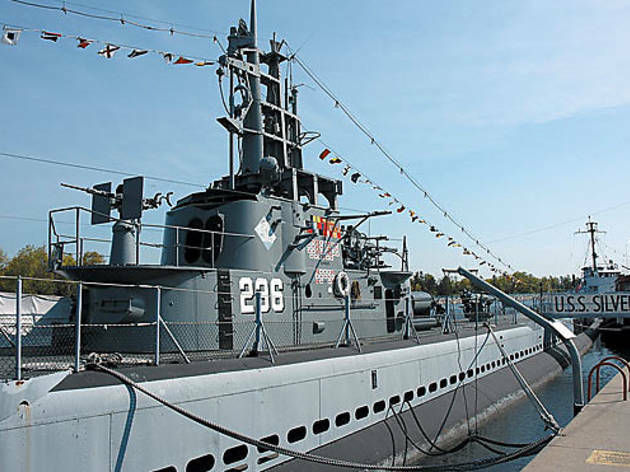 The USS LST 393 (which earned battle stars at Sicily, Salerno and Normandy) sits at the Mart Dock (560 Mart St, call 231-730-1477 for tours) in downtown Muskegon. 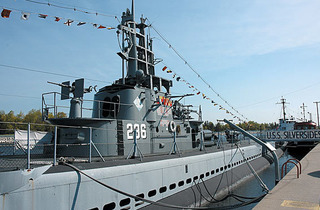 The USS Silversides SS-236 (our nation’s most famous surviving WWII submarine) and the US Coast Guard Cutter McLane W-146 are berthed along the Muskegon Channel at the Great Lakes Naval Memorial and Museum (1346 Bluff St, 231-755-1230). One of Muskegon’s charms is the Hackley-Holt House Bed & Breakfast (523 W Clay Ave, 231-557-2033; $120/night and up), an Italianate-style home built in 1857. The handsome house—which boasts a wrap-around porch and four immaculate rooms with private baths—is within walking distance of downtown attractions. Innkeeper Michelle Archambault keeps her guests happy with a tasty breakfast: fruit-stuffed French toast, sausage links and “mixed berry bake” (a rich, jamlike house specialty served warm), served on china with coffee and juice. Dog-lovers should consider the maritime-themed Langeland House B&B (1337 Peck St, 231-728-9404; $90/night and up), where the lack of private bathrooms is made up for by the owner’s adorable yellow Lab named Indy. While dining options aren’t prolific, affordable and satisfying options await. The Tipsy Toad Tavern (609 W Western Ave, 231-725-7181) offers specialty burgers with tasty toppers like barbecue sauce and blue cheese, and apps like “jumpers” (beer-battered frog legs). You’ll find surprisingly sophisticated seafood at Dockers (3505 Marina View Pt, 231-755-0400). Go for the Maine lobster and jumbo crab cakes, stay for the tiki bar and live music. Toast ’N Jams (3462 Henry St, 231-737-5267) channels a Denny’s-meets-Ed-Debevic’s vibe but with tasty fare like orange-and-vanilla French toast and quiche Lorraine. Take it all in before you leave—if the revitalization continues, Muskegon won’t look the same next year.